This next bundle of books in my Books to Inspire link are all about CREATIVITY. My KidLit choice is Ish by Peter Reynolds. In the story, a vase of flowers is not 'perfectly' drawn, so an older sibling belittles the drawing. The picture is discarded, a crumpled ball on the floor. Later, we discover his younger sister cherishes the drawing and expresses to her crestfallen brother that it looks vase-ish. And thus goes the story of Ish. You need to read this book because it is a seed-planter. You'll find yourself watering the creative efforts of others, being a spark of support, and offering the gentle nudge of encouragement. The professional selection is Creativity: Flow and the Psychology of Discovery and Invention by Mihaly Csikszentmihalyi. For me, this is the quintessential book on the Creative Process. The author's list of people interviewed in this book is impressive: scientist Jonas Salk, author Madeleine L'Engle, mathematician Margaret Butler, physicist Freeman Dyson, and many more. All these people altered their Domain/Field. In some cases, they even created a whole new one. This book makes me want to be an even better counselor. Maybe it will do the same for you. My personal pick is Soon I Will Be Invincible by Austin Grossman. Simply put, it is a fun book. Mr. Grossman certainly has no problems tapping his creative reservoir. Have you read any books with a creative bent? If so, I'd like to hear from you. 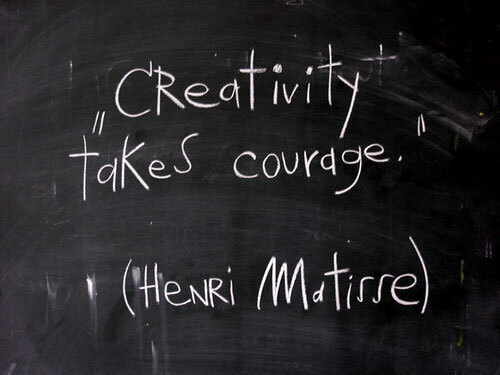 I LOVE the quote from Henri Matisse at the end of your post! It is a good quote! Thanks, Deborah, for reading my blog. Hope you visit again.